For China’s workers, the first five years of Xi Jinping’s rule (2013–2018) were characterised by slower economic growth, the decline of traditional industries such as manufacturing and mining, a rapid growth in service industries, and the increasing use of flexible or precarious labour. This led to a commensurate change in the nature and scale of worker protests, with the focus shifting away from factories in Guangdong, the traditional heartland of worker activism in China, to a more broad-based response to economic hardship across a wide range of industries around the country. In the vast majority of cases, collective action during this period was triggered not by demands for better pay and working conditions but rather by the failure of employers in both traditional and new industries to comply with even the most basic provisions of labour law. To better understand the changing face of worker activism in China, this essay will use China Labour Bulletin’s (CLB) Strike Map to illustrate the geographical and sectoral distribution of worker protests in China between 2013 and 2017. This allows for an examination of the workers’ main demands, the types of protest, the number of participants, and the response, if any, of the local authorities and police. The CLB Strike Map recorded a total of 8,696 collective worker protests from 1 January 2013 to 31 December 2017. This, of course, is not a definitive record of all the strikes in China; it is merely the incidents posted on Chinese social media and occasionally in the official media that we were able to collect during key word searches. Our sampling rate has varied over the five years but we estimate—based on the occasional and partial statistics issued by the national and local governments in China—that the CLB Strike Map accounts for about five to ten percent of all incidents of worker collective action in China during this period. The sampling rate was likely higher in Guangdong and major cities in 2013, but coverage has since been more universal. In the early 2010s, the manufacturing sector was by far the most important locus of worker activism in China. Factory workers first started organising to demand higher wages, social insurance payments, and then, as the factories started to close down or relocate, compensation for the termination of their employment contracts. 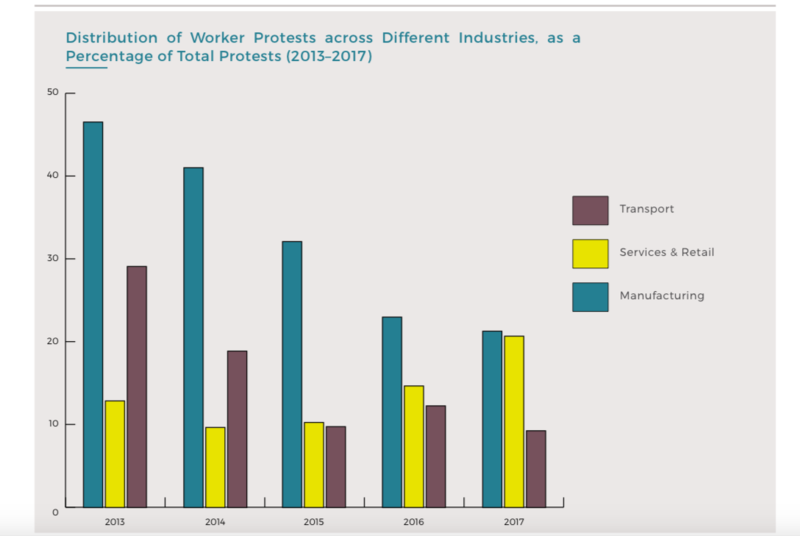 As the decade progressed, however, the proportion of factory- based protests declined as the manufacturing industry consolidated and protests in other sectors, particularly in services, increased. The proportion of protests in the manufacturing sector declined from around 47 percent in 2013 to just 21 percent in 2017, roughly the same proportion as collective protests in the retail and service industries that year. See chart below. The growing number of protests in the service and retail industries were spread out over a vast array of businesses, including shops, bars, restaurants, hotels, gyms, IT companies, banks and finance companies, medical facilities, kindergartens, as well as other private education facilities like driving schools, golf courses and amusement parks, television stations, and other local media outlets. Public sector teachers also took collective action over a wide range of issues from low pay, pensions, bonus payments, and wages in arrears. Many service sector workers were hired as informal service providers rather than formal employees and when disputes over payment of wages or severance pay broke out they often had no idea who their actual employer was. One of the most active and effective groups in this period were sanitation workers, who accounted for 8 percent of all service sector protests (CLB 2014b). Sanitation workers across China faced low pay, lack of benefits, insecure employment, and hazardous working conditions. The only way to improve their situation was through collective action. During this period, the transport sector also became a more precarious profession as the market for traditional taxis declined with ride- hailing apps gaining a larger market share. At the same time, the job security of bus drivers and conductors was threatened by increased competition from internet-based services, and couriers and food delivery workers, nearly all of whom had little or no job security, became an integral part of the urban economy. In 2013, the majority of protests in the transport sector (105 out of 188) were staged by traditional taxi drivers complaining primarily about high vehicle rental fees and competition from unlicensed cabs. By 2017, of the 117 incidents recorded in the transport sector, only 43 were by traditional taxi drivers, 10 incidents involved drivers with the main ride-hailing service Didi Chuxing, and 28 incidents involved delivery workers. In the first year of this study, more than a third of all worker protests recorded on the CLB Strike Map occurred in the southern province of Guangdong, and most of those incidents were concentrated in the manufacturing districts of the Pearl River Delta. Five years later, in 2017, the proportion of incidents in Guangdong had fallen steadily to stand at just under 12 percent of the total. See graph below. This may be partially due to a higher sampling rate for the CLB Strike Map in Guangdong in 2013 but sampling rates alone cannot explain such a dramatic shift. This dramatic fall was the result of two concurrent and related trends: the closure of low-end manufacturing facilities in the Pearl River Delta, and the development of construction, manufacturing, and service industries across the whole of China. The majority of labour disputes in Guangdong, especially from 2013 to 2015, were directly related to the decline of manufacturing in the region. As the economy faltered and more factories closed down, an increasingly elderly workforce realised they would have to take action if their legally mandated social security benefits and housing fund contributions were to be paid in full before their factory closed its doors for good, or the owner simply skipped town owing them months of unpaid wages. In some cases, factory bosses did pay their workers what they were owed before closing down the factory (CLB 2016a) and protests were thus avoided. In many other cases however management dragged their feet or refused payment outright, leading to long, drawn out, and bitter disputes such as the Lide shoe factory workers’ campaign for relocation compensation, which lasted from August 2014 to April 2015 (CLB 2015). By 2017, tens of thousands of factories in the Pearl River Delta had closed, while those that remained tended to be more stable and economically viable (Tu 2015). In September 2017, the municipal authorities in Dongguan— once known as China’s factory to the world— boasted of a 69 percent reduction in the number of collective protests by workers over the year and a 71 percent reduction in the incidence of factory bosses skipping town without paying wages (CLB 2017). The local labour officials claimed the credit themselves for reducing the number of disputes, but it seems much more likely that the majority of problem factories had already closed down or relocated to lower- cost inland or overseas locations by 2017. In 2017, the coastal manufacturing centres of Zhejiang, Jiangsu, and Shandong—as well as inland provinces like Henan, Hebei, Shaanxi, Anhui, and even Sichuan—all had substantial numbers of worker protests. In the first three months of 2018, Henan had the highest number of protests in China—44 incidents compared with 29 in Guangdong. Many inland provinces experienced rapid urbanisation and a boom in infrastructure and property development during this period. This, in turn, led to the creation of new manufacturing facilities and services in these newly urbanised areas. Local governments were keen to attract new investment with the promise of a plentiful labour supply and a business-friendly environment, which usually meant the lax enforcement of labour law. In addition, there was over-investment in unsustainable sectors of the economy, leading to numerous business failures, lay-offs, and wage arrears. Typically, disputes in inland areas tended to be relatively small-scale and short-lived, but occasionally larger protests did break out, such as when 2,000 workers at a toy factory in Luoning, Henan, went on strike in June 2015 over non-payment of wages. 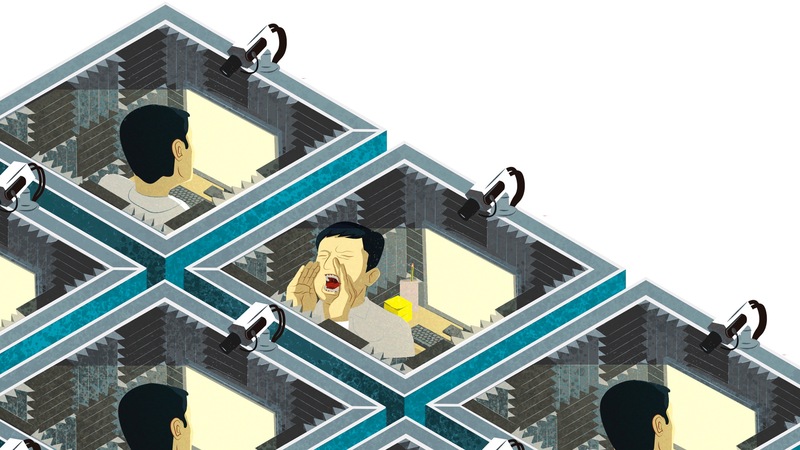 It should be noted that the rapid spread of smart phones and social media platforms across much of China during this period probably contributed to the greater visibility of worker disputes in smaller cities that might have previously slipped under the radar. In the early 2010s, China’s factory workers, exemplified by the Nanhai Honda auto workers in Foshan, launched a series of strikes demanding better pay and working conditions. These strikes were a direct response to rapidly rising living costs and a long period of wage stagnation during the global economic crisis. Wages in the manufacturing sector did increase significantly in the first few years of the decade although wages in service industries tended to lag behind. As economic growth slowed in the mid-2010s, however, wage increases started to level off and the problem of wage arrears came more and more to the fore. As the chart above illustrates, workers’ demands for pay increases steadily declined during the five-year period of this study. At the same time, demands for payment of wages in arrears shot up from 25 percent of all protests in 2013 to 82 percent in 2017. The non-payment of wages has been a perennial problem in China’s construction industry for decades. Construction workers are separated from the main project developer and financier by numerous layers of sub- contractors and, in most cases, they are only paid on completion of the job. Every year, in the run-up to the Lunar New Year, millions of migrant workers are forced to stage desperate protests just to get paid in time for the holiday. As noted above, the issue of wage arrears has persistently dogged the manufacturing sector, with factories suddenly closing and the boss vanishing. However, the deliberate non- payment of wages is increasingly spreading to other industries as well, particularly services and new start-up enterprises. Of the 1,033 wage arrears cases recorded on the CLB Strike Map in 2017, just under half (507) were in the construction industry, while 212 were in manufacturing, and 223 were in services and retail. The growth of new industries in China has created new problems for workers. Many of the jobs in service industries, such as couriers, food delivery, and telecom sales, are insecure, low-paid with little or no benefits, and place excessive demands on the time of individual workers. The Chinese government, and in particular Premier Li Keqiang, has placed excessive faith in the ability of start-up enterprises to generate decent and stable jobs (China Daily 2015). Many start-ups fail within a year or so of being established, and when they do collapse or get into financial difficulty, their employees simply do not get paid. 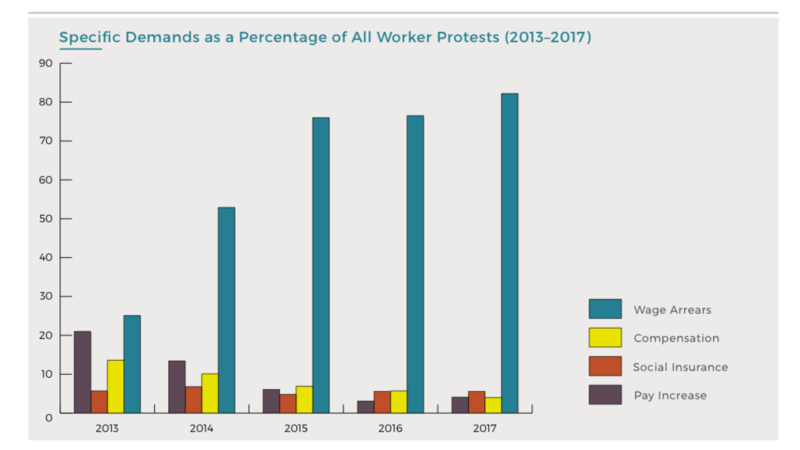 One of the most obvious trends discernible from the CLB Strike Map over the last five years has been the decline in the number of major protests. In 2013, nearly 10 percent of all protests involved more than 1,000 workers. The following year, the proportion had dropped to 7.2 percent, even including five massive protests with more than 10,000 workers, such as the Yue Yuen shoe factory strike in Dongguan in April 2014, which saw up to 40,000 workers out on strike for two weeks. 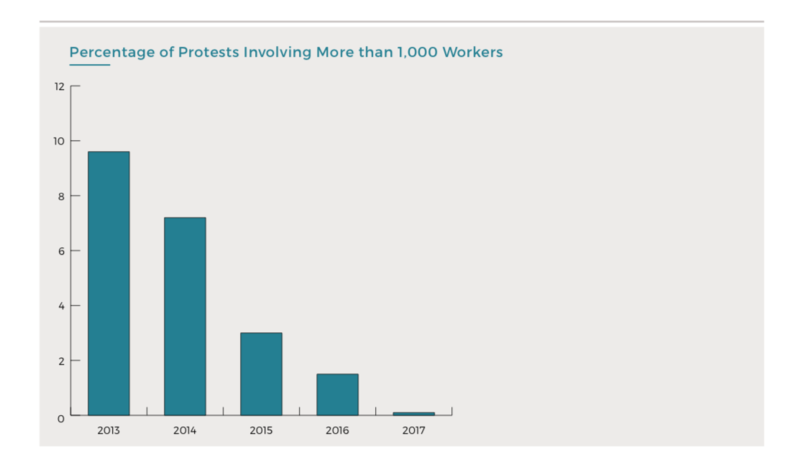 In the next three years the proportion of major protests dropped dramatically to the point last year where we recorded just one incident involving more than 1,000 workers (see graph below). So far this year, we have recorded another 7 incidents with more than 1,000 participants. Please note, however, that CLB takes a quite conservative approach to protest size and we are more likely to under-estimate than over-estimate the number of participants. Heilongjiang province, which occurred during the 2016 National People’s Congress, the authorities went to great lengths subsequently to ensure that laid-off workers in the state sector were paid in full and adequately compensated during the closure or contraction of major state-owned enterprises (Financial Times 2017). While the number of static large-scale protests has fallen significantly, this does not necessarily mean that workers are no longer organising on a larger scale. In 2016, for example, tens of thousands of Walmart workers joined online groups in response to the company’s attempts to impose a flexible working system on its roughly 100,000 employees in China. The online groups created a sense of solidarity among Walmart workers across the country and allowed them to share information and strategies that could be used to resist management attempts to erode their benefits (CLB 2016b). Workers in other service industries also used social media platforms to organise simultaneous small-scale protests in different cities. For example, on 27 June 2016, sales staff at Neutrogena organised coordinated protests outside the company’s offices in Beijing, Guangzhou, and Shanghai. Most collective labour disputes in China are short-lived and are resolved or dissipate without the need for government intervention. It is difficult to gauge exactly how often local governments do get involved in labour disputes because such actions are not often detailed in social media posts about collective protests. When local officials do turn up it is clear that their primary concern is to contain and resolve the dispute as quickly as possible. Local government officials will often attempt to mediate or intervene by putting pressure on both labour and management to make some concessions and compromise so that production can return to normal. However, these quick fixes rarely address the fundamental grievances of workers and do little to mitigate the tensions in labour relations that gave rise to the workers’ collective action in the first place. If there is a trade union branch at the enterprise at the centre of a dispute it is usually a passive bystander or it will sometimes side with management in its attempts to get the employees back to work. Just about the only exception during this period was Huang Xingguo, the head of the Walmart store trade union in the central city of Changde, Hunan province, who led staff in a month-long dispute over severance pay in 2014 (CLB 2014a). District trade union officials do sometimes get involved in labour disputes but, like the local government officials they are associated with, their primary concern is to get striking employees back to work. That said, the municipal trade union federations in Shanghai and Shenzhen have taken some steps in the last two years to help organise food delivery workers and support Walmart employees in their campaign against the unilateral imposition of flexible working hours. Police do not normally get involved in labour disputes unless the incident is deemed a threat to public order or the business owner specifically requests police assistance. Police officers intervened in about a quarter of all incidents recorded on the CLB Strike Map during the five-year period from 2013 to 2017. As indicated in the graph in the next page, there was a spike in police interventions in 2015, which coincided with an intense period of worker activism in Guangdong but also elsewhere, and directives from Beijing to take a tougher stand against civil society in general. As might be expected, the police were far more likely to get involved in larger-scale protests. In collective protests involving more than 1,000 workers, for example, police intervened in about 50 percent of cases and made arrests in 20 percent of them. It is clear from the data that a police presence does not necessarily lead to the arrest or detention of worker activists. In most cases, the main concern of the police is to contain the protest as much as possible and prevent it from causing a disruption to public order or traffic. If arrests are made, they are nearly always related to offences such as ‘gathering a crowd to disrupt public order’ rather than simply going on strike, which is not technically illegal in China. In most cases workers are only detained for a few days, but occasionally well- known labour activists are sentenced to longer terms, such as veteran activist Meng Han who was sentenced to 21 months in jail in 2016 for his role in the Lide shoe factory the previous year (CLB 2016c). The last five years have been a period of rapid transition for China’s workers as they adapted and responded to a new economic and political reality under Xi Jinping. Workers were challenged by the decline in traditional industries and the emergence of new and precarious patterns of employment in the service industry. The lack of an effective trade union that could represent workers in collective bargaining with management and the absence of institutions or accepted practices that might help resolve collective labour disputes peacefully and constructively meant that workers had little option but to resort to strikes and other forms of collective action to air their grievances. Although we do not have any definitive data on the number of collective worker protests during this period, we can conclude with some confidence that while large-scale factory protests probably reached a peak around 2015, smaller-scale protests over a much broader range of industries and regions continued to erupt on a very regular basis across the entire country. These persistent protests have presented the authorities with a serious challenge as they struggle to fulfil Xi Jinping’s pledge to improve the lives of ordinary working women and men in China. In particular, the increasingly casual and precarious nature of employment in China today will make it very difficult for local government officials, who are already notoriously lax in enforcing labour law, to guarantee that labour rights are adequately protected. This article was originally published on Made in China, Issue 2, 2018. Original artwork by Marc Verdugo. China Labour Bulletin. 2015. “The Lide Shoe Factory Workers’ Campaign for Relocation Compensation.” China Labour Bulletin, 22 June. http://www.clb.org.hk/en/content/trying-hit-moving-target-lide-shoe-factory-workersâ€™-campaign-relocation-compensation. China Labour Bulletin. 2014a. “Unity Is Strength: The Story of the Guangzhou University Town Sanitation Workers’ Strike.” China Labour Bulletin, 16 October. http://www.clb.org.hk/en/content/unity-strength-story-guangzhou-university-town-sanitation-workersâ€™-strike. 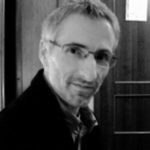 Geoffrey Crothall is Communications Director at China Labour Bulletin (CLB). He has worked at CLB since 2007 and was the Beijing correspondent for the South China Morning Post from 1991 to 1996.